Water is an essential component of pharmaceutical formulations. Purified Water (PW), Low Pyrogen Purified Water (LPW) and Water for Injection (WFI) are highly regulated ingredients requiring assurance that microbiological contamination is prevented. All components are sourced from leading global suppliers to ensure highest quality and local sources available for spares. Siemens S7 PLC with touch screen HMI to allow ease of operation and monitoring. Control and monitoring from a single interface with data logging facilities and links to user BMS/SCADA systems. The control system has the flexibility to operate complete turnkey packages allowing customers to reduce costs and simplify operation using a single access interface for pre-treatment, purification, storage and distribution. It is a compact system for the Storage, distribution, sanitization & monitoring of Purified Water, Highly Purified Water. Variable speed drive pump for distribution of the pure water, UV radiation unit for prohibit the bacteria from growing, flow rate temperature & conductivity measurement (with online TOC measurement as an option). With the compact system, the entire storage & distribution system can be sanitized by adding ozone (generated from Purified Water itself) to the circulating water. This eliminates the requirement to periodically shutdown the system for Hot Water Sanitization. 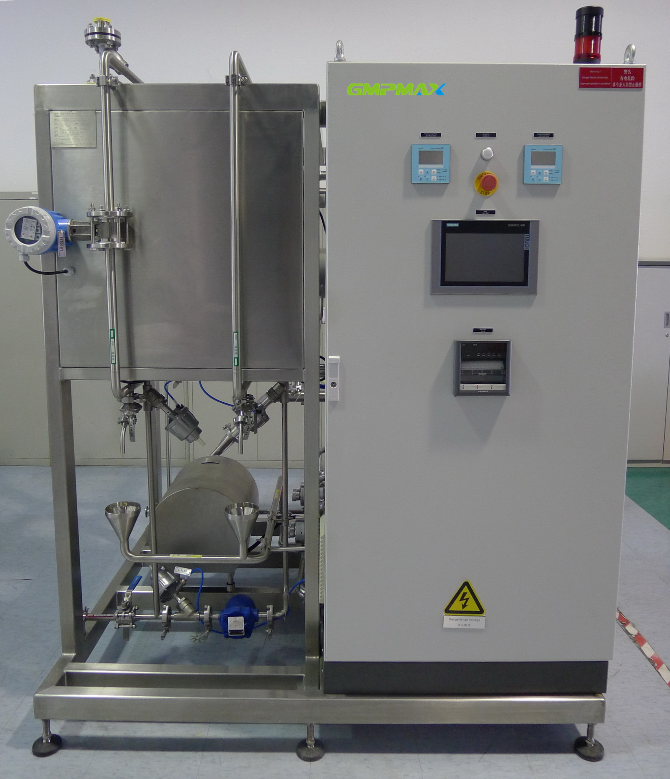 Microbial counts less than 010CFU/100 ml without maintaining PW Loop at 80 ℃ can be obtained using this system. Pumps to be deliver fully turbulent flow. Heat exchangers to be double tube sheet shell and tube type, allowing visibility of any leakage. User point to be Zero dead leg/GMP user point (3D). Return flow of loop will be above 1.5m/second. All pipes in contact with PW are orbital welded or joined with TC connection. 20% X-ray test or baroscopic test to ensure sanitary system. Pipe work to be installed to achieve minimum slope at 1% to allow self-draining and deflection will be accepted. Pipe work to be handled assuring permanent protection of pipes ends from dirt and contamination (caps) for any loop component. All necessary support devices, user point apparatus (plant area/room/clean room) to be provided and installed by GMPMax audited supplier.